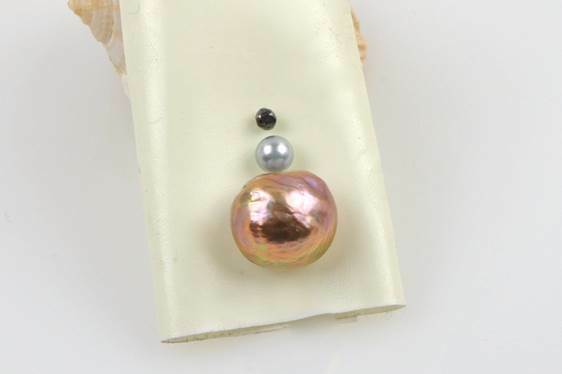 Carolyn from Oregon bought a spectacular 11mm x 14mm natural-colour auburn Kasumi pearl (Kojima Company), then e-mailed to say she was thinking of having a pendant made, and wondered if I had any ideas. Does the Queen have corgis? Carolyn considered recycling her old pearl studs and also said, "I have a great goldsmith but not necessarily a great jewelry designer. I like very clean lines, so maybe just beads/pearls on a chain. I was even thinking of trying a good bead store..."
Carolyn made the leap of faith to work with a Sarah via photos and phone calls. Now on the right foot, Carolyn also gave her a budget and a realistic time frame. When you have a showstopper pearl (or gemstone), doing just a little, but doing that little right, is essential. 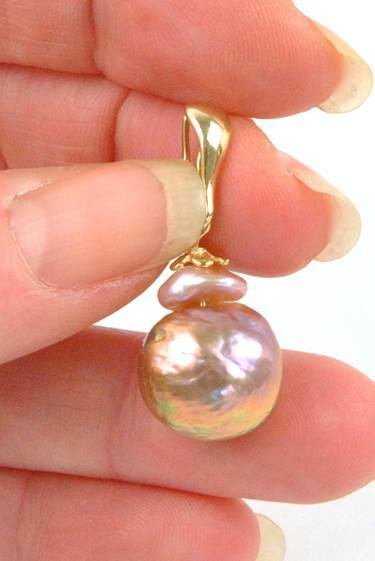 The pendant has a snap bail so Carolyn can add it to a her other necklaces or her gold chain, but she also thought about another idea I've shown here, small pearls as a 'chain'. Sarah showed her 3mm CFW white ovals, and small white keshis; Carolyn chose the ovals. The cost for those was only about $135. She now has three elements (pendant, snap bail and pearl 'chain' strand) that extend her jewellery wardrobe. 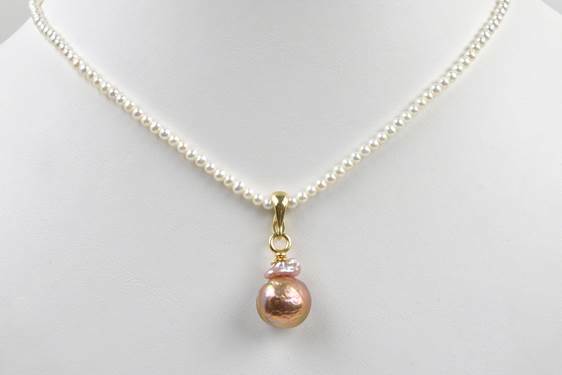 She said, "I can use all three components with other pieces; might be fun to get a vintage charm to snap on the clasp and wear with the pearl strand." When I thanked Carolyn for sharing these photos, she said, "I think it's good for readers to know the mistakes I almost made. I ended up asking Sarah for her frank advice and predictably ended up with a much better piece by trusting her—she has a wonderful sensitivity and design eye." When a designer and her client share a sensibility, and the designer takes her time, the piece is absolutely in harmony with its wearer—and hers alone. Chere Duchesse--It has taken me all this time to perform the annoying (but only 30 second) task of signing into my account to comment. I really love this post: it shows how pearls can have an enormous aesthetic impact for a relatively small price. The first day I wore the beautiful pearls that you helped me with, a woman stared at me at the grocery. Finally, she said with uncertainty, "I love your sweater." I think she did not love the sweater (truly nothing special), but loved SOMETHING, and couldn't figure out what it was. I'm sure it was the necklace. 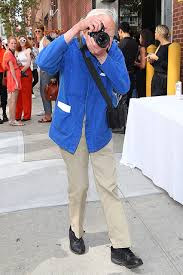 By the way, I love that "coatigan"--and it is hand washable, so no nasty drycleaning! Very impressive, so beautiful. I can see why she wears them every day! What a gorgeous result! Thanks to you both for sharing the steps it took to get there, very helpful and enjoyable. Your sage advice led her to the right design for that gorgeous pearl. BTW, I laughed out loud at the corgi comment. What a beautiful creation! The pink pearl was just what was needed. I can't thank our Duchesse enough for her generous assistance. Without her, I would never have dared trust an online vendor. And would have missed the very satisfying experience of working with Sarah at Kojima. And I would not have come close to having that special piece - or rather the beginnings of a pearl wardrobe capsule - which I absolutely adore. I rarely buy jewelry but I will add a couple more special pearls to my little collection. 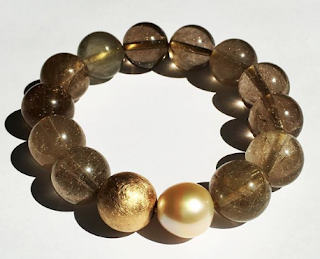 Isn't it amazing that through this blog a Montreal style/artist assists an Oregon Christmas tree farmer in working with a Bay Area pearl expert/designer to create a special piece of signature jewelry? Gorgeous! You have prompted me to take action! I will be in northern CA this summer and plan to bring my soon-to-be-renovated pearls for a meet w Sarah. I think she is in San Rafael, CA? And I may try the online option as Carolyn had so much luck. You have written about this several times and I always thought, "someday." 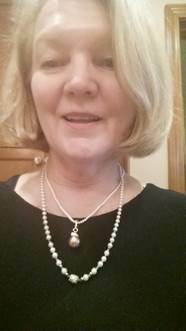 I have pearls I never wear because they aren't quite right... No more excuses! 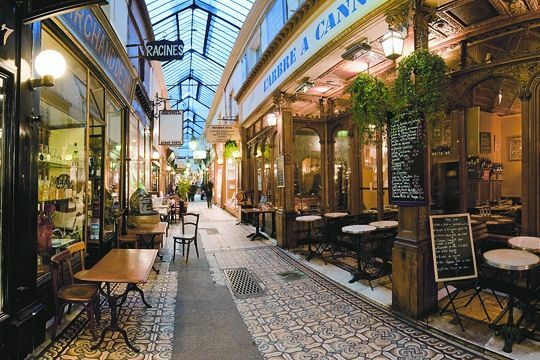 Great post and wonderful advice, Duchesse! royleen: Yes, she is in San Rafael. There is nothing like meeting the jeweller, even if it can only be for the initial meeting. I will soon show one of my projects for which I met the jeweller once and then we worked via sketches and photos. I couldn't agree more, no more excuses.